Never one to turn down the opportunity of some free food, when our social media guru, Emma, found through her sources that a fast food restaurant in Vancouver was giving away a free lunch in return for only a ‘like’ on Facebook, we were straight on the case! Frites is a Belgian themed restaurant in downtown Vancouver. Its speciality is to serve burgers not in the usual burger bun, but sandwiched between a waffle cut in half. Given that it was a promotional day, our choices were limited. So we both picked up a grilled chicken waffle burger, replete with a sauce of our choice, tomato and lettuce. On the side we got some fries (perhaps the only other Belgian connection other than waffles), again with a choice of dips or toppings. Emma went for the Canadian ‘national dish’ of poutine, whilst I had the bacon and chive dip. So what’s the verdict on this unusual take on the burger. Well the fries were great. The grilled chicken and sauce were good. Tomato and lettuce, well you can get that anywhere can’t you? The waffle, well, just give me a normal burger bun thanks. A waffle should normally be crispy on the outside and soft on the inside, and ideally topped with ice cream and some sort of syrup or chocolate sauce. This waffle was cakey all the way through, and so didn’t really go with everything else. But it was free, so maybe there are no grounds for complaint! This would now be an opportune time to show you a photo of this culinary wonderment, but because the restaurant was jam packed with students and the unemployed (us), and there was no seating area, we were forced to stand up and juggle our burger and chips which came in separate containers, and so had no hands free for taking a photo or two. Next up we headed to the Vancouver Police Museum. Doesn’t sound very exciting does it? 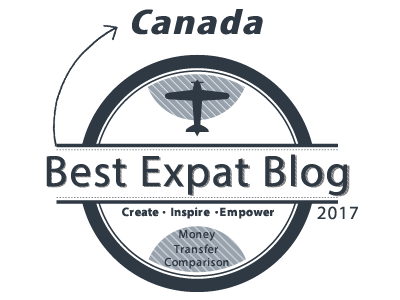 But actually it came highly recommended by the Vancouver Visitor Centre and also got some good reviews on Tripadvisor. Given it was a rainy day, it seemed an ideal way to spend the afternoon. There was a problem with the museum though. We couldn’t get in! We pushed on the door. We pulled on the door. 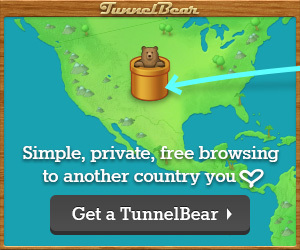 But it wouldn’t open. We checked the sign by the door – it should be open on this day and at this time. So we knocked on the door, twice. Nothing. So we phoned them. “Yes, we’re open, you just have to push the door really hard”. Feeling a bit stupid we shoved it even harder and finally we were inside! The visitor desk explained that they often have this problem with the door. Whilst in there we heard some other people trying to get in. They resorted to banging on the door hard and shouting through the letterbox. Eventually after a few minutes (yes, minutes of someone frequently banging on the door and shouting) did the member of staff lean out of the window and offer words of advice! So it wasn’t only us who struggled with the door. I wonder how much trade the museum loses every year because of their sticky door! The Vancouver Police Museum and its troublesome front door! Anyway, back to the actual museum itself. It’s housed in the city’s former Coroner’s Court Building, and for those who like black & white films, this was where the actor Errol Flynn (who?) was brought for his autopsy in the 1950s having died in the city. 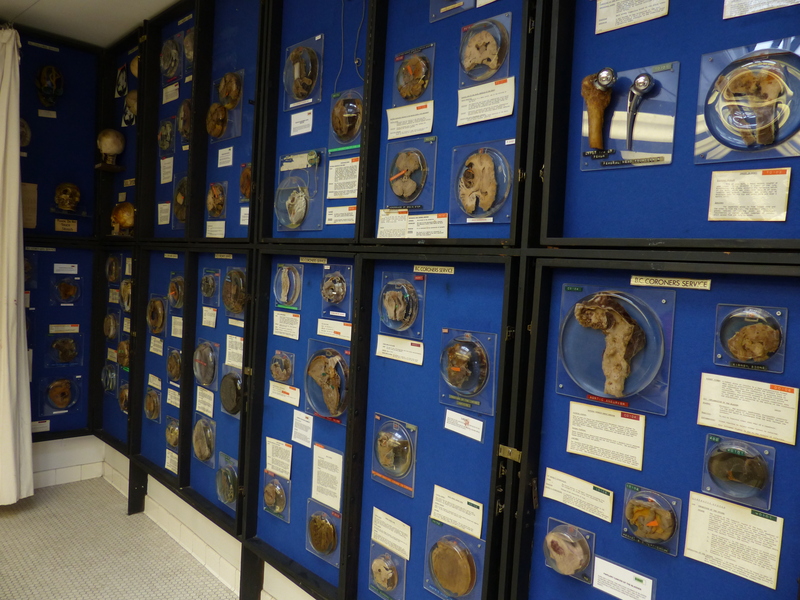 The museum is small, yet has a varied collection of exhibits and artefacts. Some of the exhibits are very dated, whilst others are more modern. The exhibits chart Vancouver’s policing history, from the early days 150 years ago when the city was founded, up to modern policing of major incidents through the city’s Emergency Response Team. 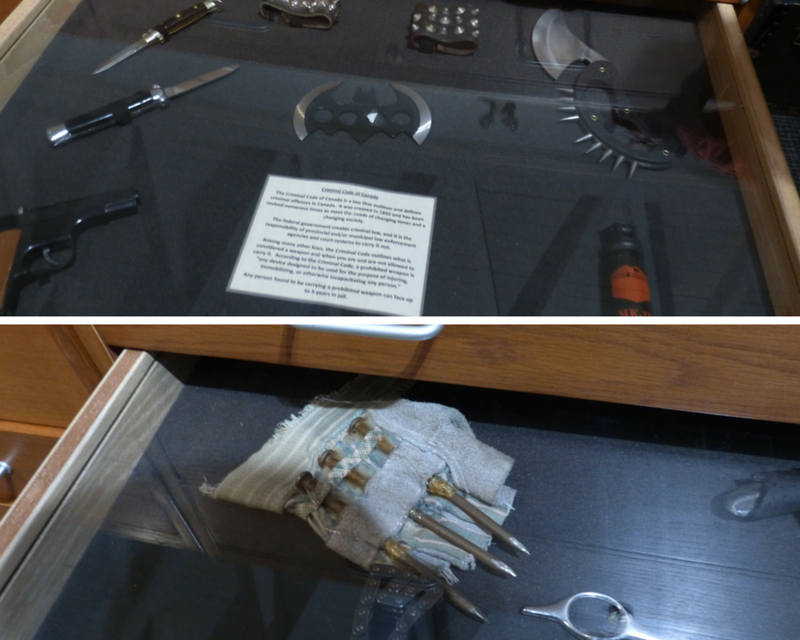 Amongst the display are firearms, a collection of seized weapons, gambling material, counterfeit money and clues from some of the city’s most famous resolved and unresolved murders. 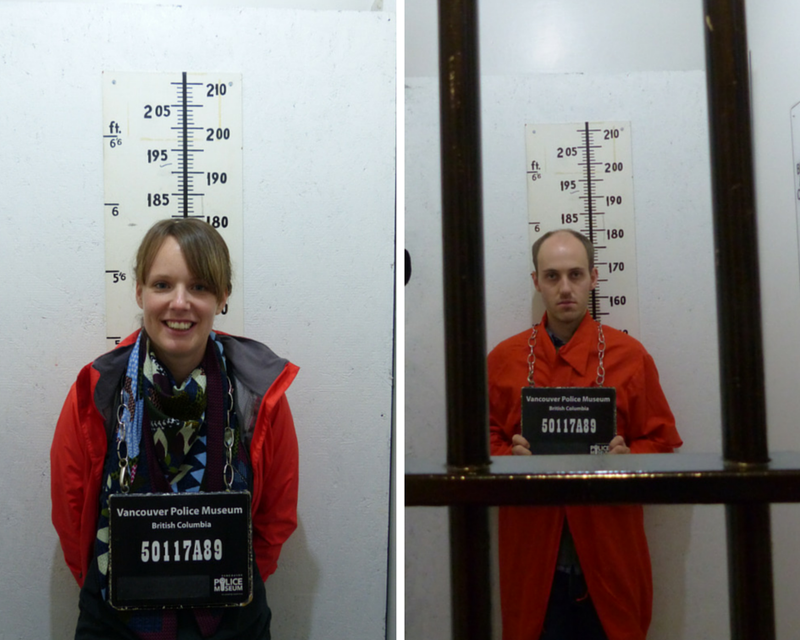 Visitors can also try their hand at forensics, such as through identifying crime scene fingerprints and foot prints, and building an e-fit having caught a glimpse of a criminal’s face. 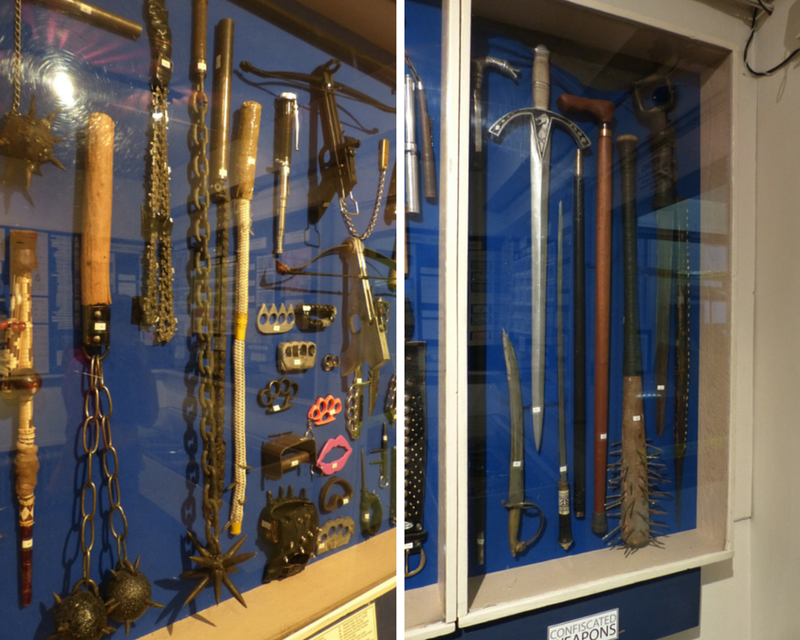 Just some of the items in the collection of confiscated weapons. The baseball bat with loads of nails sticking out is worth a mention, as a kid had made it at home, and then took it to school. His teacher then called the police! Finally, the centrepieces of the museum are a couple of macabre rooms. 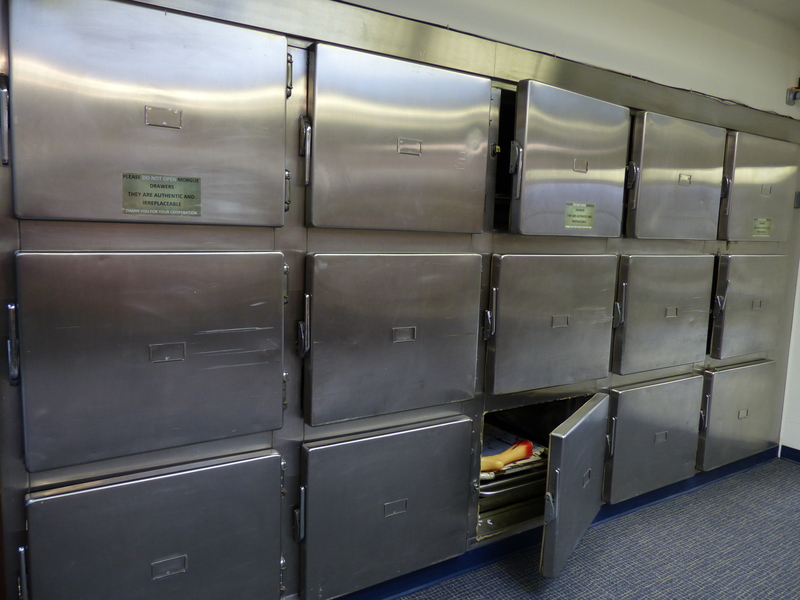 The first is the morgue with its cooled body storage units, and adjacent to that the autopsy room complete with autopsy tables and instruments. No one seemed willing to pose for photos on these! 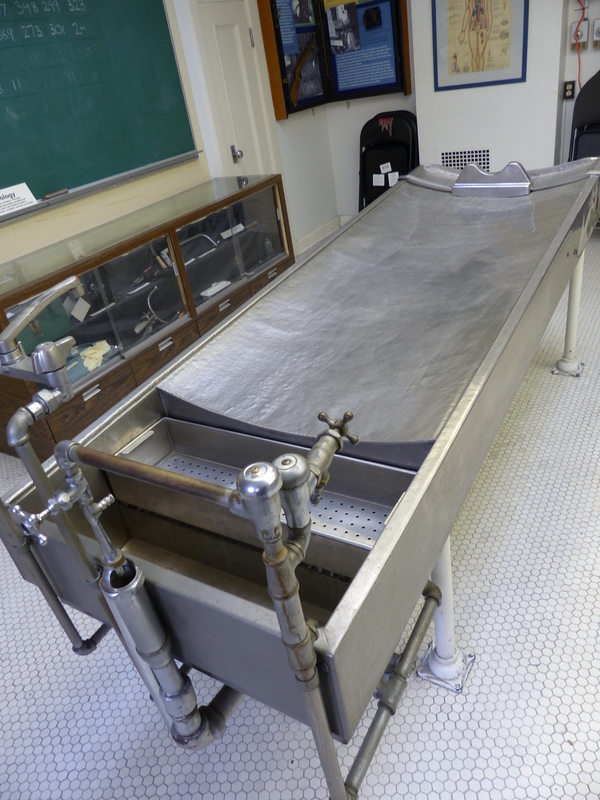 One of the two autopsy tables, which is angled towards the basin and drain at the end so to collect all those bodily fluids! 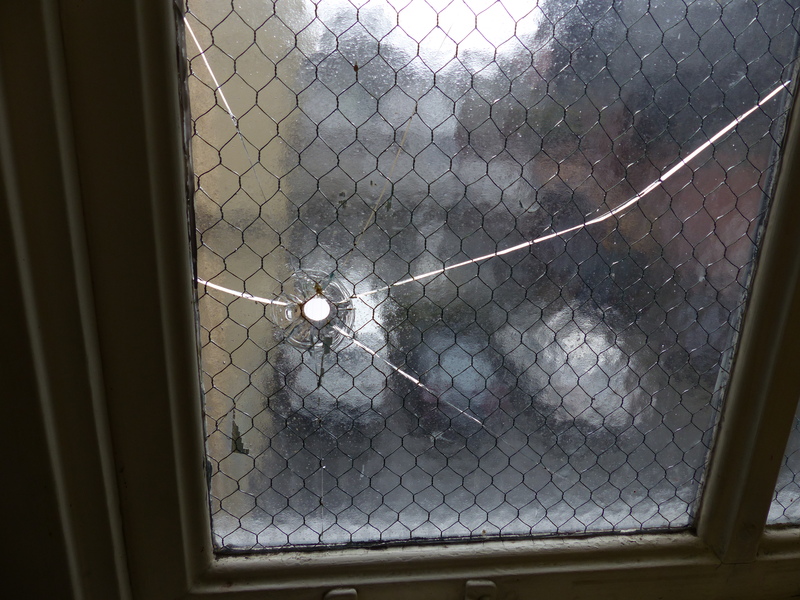 The window in the autopsy room has a bullet hole in it, from when a criminal in the alley below tried to shot the coroner who was performing the autopsy on the criminal’s victim. He missed though! All this probably makes Vancouver appear as some massively unsafe city, given that they can dedicate a museum just to the policing of the city! Well, despite dodgy areas like East Hastings Street (and all cities and towns have a dodgy area), it feels just as safe as any other big city, so there’s no need to worry! 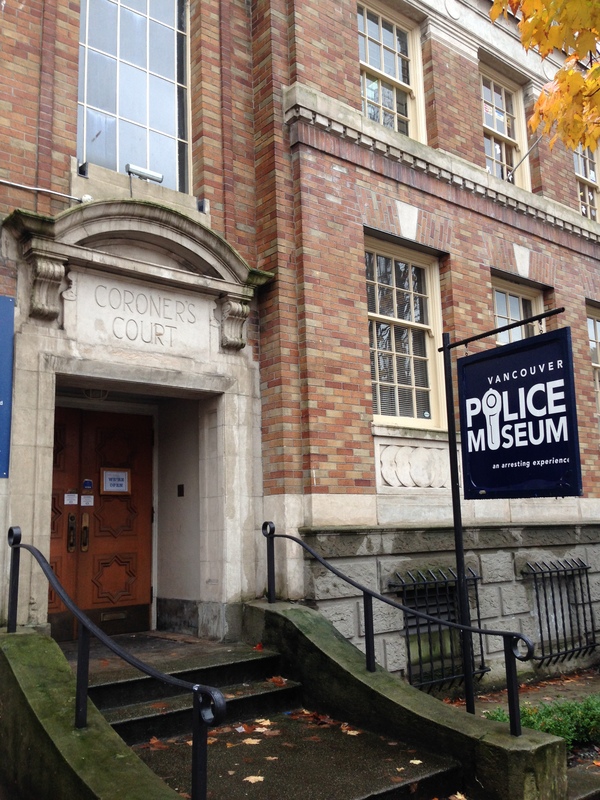 So, if you’re looking for something to do on a rainy day in Vancouver, or pre-1980s autopsy rooms is your thing, then the Vancouver Police Museum is the place for you!